Custom Doors to fit you style. Choosing the right overhead door for your application can be difficult. With the help of our experienced staff you can be sure you will be informed on all options available to help you make the right choice for your garage door. We take pride in our garage door service with prompt, courteous, professional specialists who will tackle your problem with a guaranteed low price- anywhere, any day, any time! All of our garage door service technicians work for us and are trained to meet our very high quality standards. 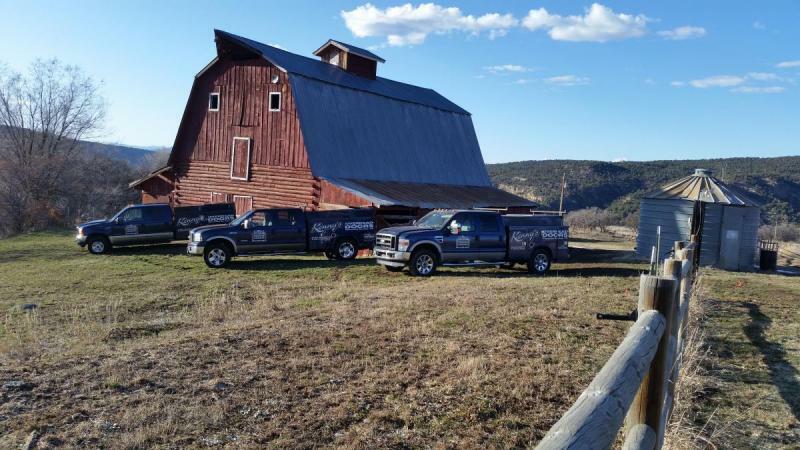 Our garage door service area include Aspen, Snowmass, Basalt, Carbondale, Marble, Redstone, Glenwood Springs, Avon, Edwards, Gypsum, Eagle, Vail, Meeker, New Castle, Silt, Rifle. Our base of operation is out of New Castle Colorado and Glenwood Springs Colorado. Currently we are using Liftmaster Brand Operators for both Commerdcial overhead doors, and residental garage doors. Click here for Resedential Liftmaster Garage Door Openers. Click here for Commerdcial Liftmaster Overhead Door Operators. Glick here for Gate and Specialty Openers as well at Access Control Panels. We are using the model 8550W as our top of the line operator. Click here for the Web Link. This 8550W operator has internet capability, battery backup, timer to close, motion sensor for the lights. The other models they have , I do not use, mainly because the features are so similar and the cost are so close that we try to limit the different models that are out there so the repair parts we keep in stock are in our trucks. We are also using products by Marantec Garage Door Systems. Click here to view thier products. We intall Resedential and Commerdcial Garage Steel Doors by CHI Overhead Doors. Click here to view thier Garage Door Types. For commercial rolling steel doors a I am using Cookson Door Products as well as CHI Commerdcial Products. For our signature wood covered sided doors, and the latest rage, aluminum and glass doors, We are using Northwest Door. Northwest Door for Aluminum and all Glass doors. They have Residental Dorrs, and Commercial Doors to choose from. Call the garage door experts - we do not make you fill out any forms online and get back to you. Just call 970 945-8913 or 970 945-8915 FAX or call the local number nearest you and we will have an expert garage door service technician sent to you in as soon as possible. One of our workshop locations is in Glenwood Springs Colorado. With our 100% guarantee and limited lifetime garage door and garage door opener warranties, you can rest assured your garage door needs will be taken care of. We've been around for many years and look forward to serving you for many years to come. Copyright © 2009-2017 doormangws. All Rights Reserved.